To put baby on a schedule or to go with the flow – that is the question. When my first child was born, I was trying to determine ways to predict how her day would go, so putting her on a schedule worked for me. This being said, it wasn’t rigid, and we often were able to pivot from that schedule some, as needed. Why does a schedule work? They know what to expect: When your child is on a schedule, they (and you) know what to expect from a normal daily routine. If they are used to going down for a nap between 10am-10:30am every day, you’re going to find they will start to get sleepy every day at that time, and if you don’t miss that window of opportunity, they’ll go down very easily. If you miss your window, depending on your child, you may end up with a fussy little one because they have now become overstimulated. Granted, there are some baby personalities that will go with the flow and sleep anywhere and at any time. If you have this baby, you will have a lot more flexibility in your routine. They don’t become overstimulated: If you have a child that is a little more spirited, or becomes overwhelmed after too much time being active, you may find yourself in need of sticking to your routine a little more closely. They key is to know your child’s personality, and tailor your routine around that as much as you can. Overstimulation means a cranky and sometimes inconsolable child, so you want to avoid that if possible. Read More: Are you Overstimulating Your Baby? In my personal experience, it is definitely possible to make the schedule work in your favor. If you need the schedule to change in some way on a more permanent basis, shift the time of each activity by 10-15 minutes each day until you get to the desired time for nap or regular outing. If you want your child to be able to nap on the go, then set the stage for that out the gate by keeping them out during their naptime from time to time, but provide them with the opportunity to sleep in a carrier faced towards you (so they can avoid additional stimulation) or in their carrier or stroller with the cover obstructing their view. 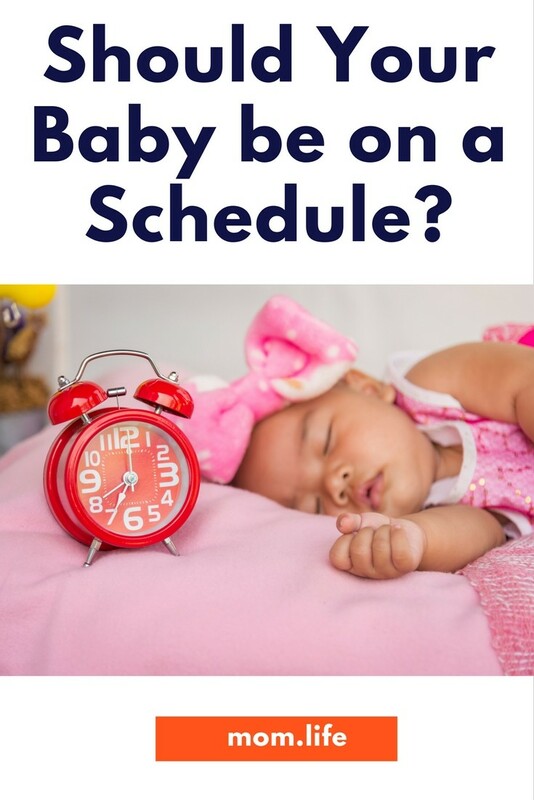 Having a schedule doesn’t have to mean inflexibility, it just means that you are providing predictability which helps you and baby know what to expect. If changes are made, plan to make them ahead of time, and depending on your child, make the necessary shifts accordingly. Join Us: Want support with sleep and other new mom issues? The mom.life app is the best place to connect with other moms like you!